To prevent damage to the electrical system due to shortcircuiting or overloading, each individual circuit is provided with a fuse. There are fuse blocks in the passenger compartment and in the engine compartment. 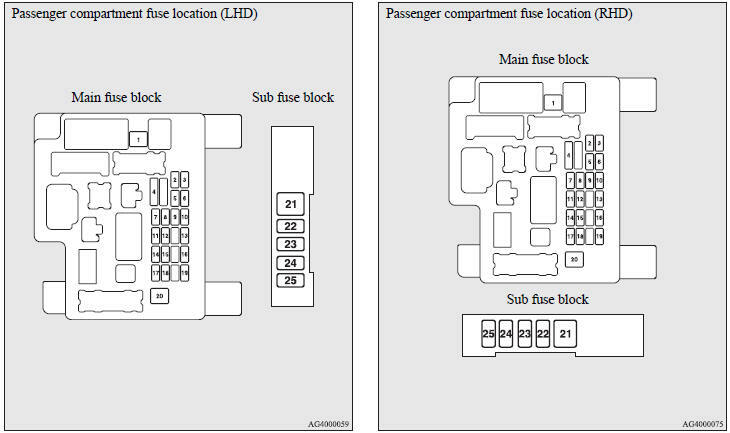 The fuse block in the passenger compartment is located behind the personal box in front of the driver’s seat at the position shown in the illustration. A- Main fuse block. B- Sub fuse block. 1. Open the personal box and pull to remove it. 2. To put back the personal box, line up the personal box hook (C) with the clamp (D) on the instrument panel and push the box back in. 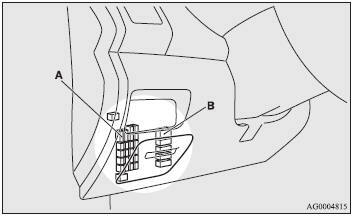 The fuse block in the passenger compartment is located behind the lower glove box at the position shown in the illustration. 1. Open the lower glove box. 2. Move the rod (A) on the left side of the lower glove box to the left side of the box. 3. 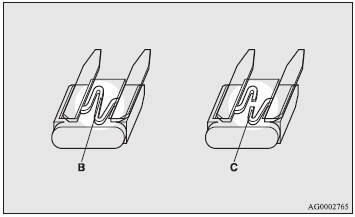 While pressing the side of the lower glove box, unhook the left and right hooks (B) and lower the lower glove box. 4. Remove the lower glove box fastener, and then remove the lower glove box. 1. Remove the cover from the bottom of the glove box. 1- Push the knob (A). 2- Remove the cover. 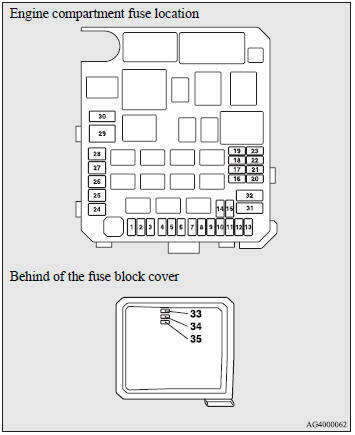 In the engine compartment, the fuse block is located as shown in the illustration. The fuse capacity and the names of electrical systems protected by the fuses are indicated on the inside of the personal box (LHD vehicles), the inside of the lower glove box (RHD vehicles) and inside of the fuse block cover (inside of the engine compartment). ● Spare fuses are provided on the lid of fuse box in the engine compartment. Always use a fuse of the same capacity for replacement. 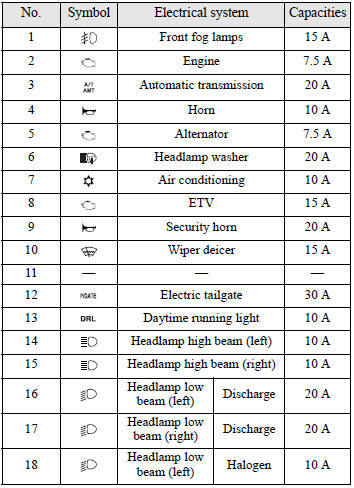 ● Some fuses may not be installed on your vehicle, depending on the vehicle model or specifications. 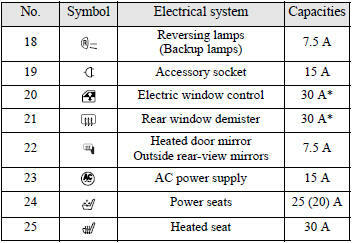 ● The table above shows the main equipment corresponding to each fuse. 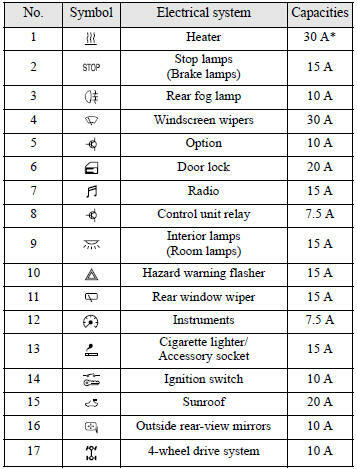 ● The table above shows the main equipment corresponding to each fuse. The fuse box does not contain spare 7.5 A, 25 A or 30 A fuses. If one of these fuses burns out, substitute with the following fuse. 7.5 A: 10 A spare fuse. 25 A: 20 A spare fuse. 30 A: 30 A audio amp fuse. When using a substitute fuse, replace with a fuse of the correct capacity as soon as possible. 1. Before replacing a fuse, always turn off the electrical circuit concerned and place the ignition switch in the “LOCK” position. 2. Remove the fuse puller (A) from the inside of the fuse box in the engine compartment. 3. 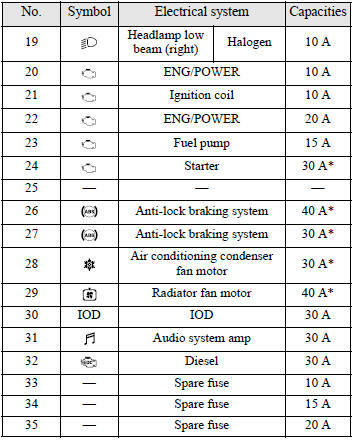 Referring to the fuse load capacity table, check the fuse pertaining to the problem. B- Fuse is OK. C- Blown fuse. ● If any system does not function but the fuse corresponding to that system is normal, there may be a fault in the system elsewhere. We recommend you to have your vehicle checked. 4. Use the fuse puller to insert a new fuse with the same capacity. Make sure you insert the fuse into the same location in the fuse block. ● If the newly inserted fuse blows again after a short time, we recommend you to have the electrical system checked to find the cause and rectify it. ● Never use a fuse with a larger capacity than specified or a substitute (such as a cable or foil). Doing so could cause the circuit wires to overheat and create a fire.